That's 'Dougernaut' to you: Buccaneers RB Martin during a 106-yard rushing performance against Carolina on Oct. 4. 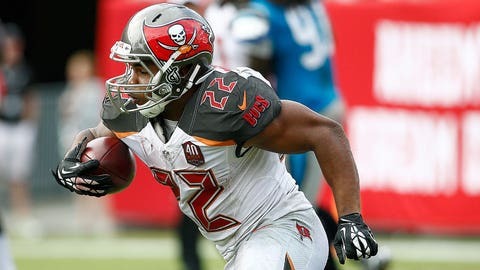 Tampa Bay Buccaneers running back Doug Martin has been trying to kick his "Muscle Hamster" nickname to the curb for a while. Doug Martin, who doesn't like the "Muscle Hamster" label, said he's going with "Dougernaut" as his nickname from now on. "The name ‘Muscle Hamster’ is the worst nickname possibly ever given to somebody," the 5-foot-9, 218-pound running back told USA Today Sports in June. "I hope it changes, and I hope that I play to a level where my nickname changes. That’s what my goals are." "You know, some people like it. Some people hate it," Martin told ProFootballTalk on Oct. 17. "I hate it but it hasn’t gone away. I’m still waiting for that new nickname, for a new nickname to emerge." Well, if he had to earn a new nickname with his performance, "Dougernaut" is apt: Martin has had 405 yards on 90 carries (4.5 ypc) and three touchdowns through five games so far in 2015. Only time will tell if the Dougernaut sticks.